All photos submitted must be original and authentic ( NO Photoshopped images! ) and must not be taken from other source material. Entries should be submitted in either JPEG (jpg) or GIF formats and posted on the Spondyville Facebook page or sent to: Spenser23@aol.com. The contest runs from January 5th until March 4th (Spondyville's "Founder's Day"), and drawings may be submitted up until 11:59 PM Pacific time on March 4th. Prizes will be given to one (1) entry from each of three categories; Best Classic Snowspondy Pose, Best Family Pose with a Snowspondy and Most Creative Photo of a Snowspondy. Winners will be announced on March 12th. Photos may be submitted by anyone who can pronounce Ankylosing Spondylitis or knows someone that can pronounce Ankylosing Spondylitis. PLEASE NOTE: Photos must be of SNOWSPONDYS, No photos of ordinary Persons of Snow will be accepted. Photos will be judged on their style and artistic value by a blue ribbon panel of judges. 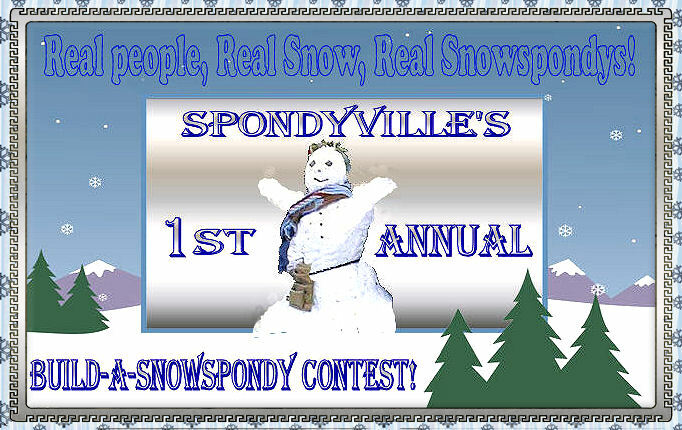 All entries become the property of Spondyville. One Grand Prize will be awarded in each category. 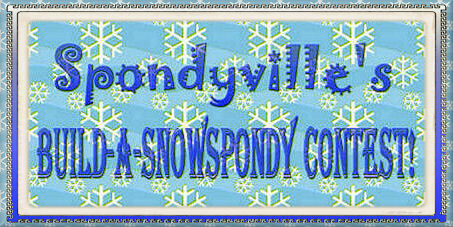 Grand Prize winners may chose any item from the Spondyville Cafe Press store. BREAKING NEWS: Due to Global Warming issues, some Spondys have requested the "Reasonable Facsimile" clause be put into effect.